Grab the one you love for a romantic escape. Let us set the mood for your special stay with champagne and flowers upon arrival. Enjoy €25 on us in our restaurant or bar and wake up to a romantic breakfast for two the next morning. Above all, you will benefit from our Andaz inclusions such as complimentary snacks and non-alcoholic drinks from the mini-bar, Wi-Fi and a cup of coffee or glass of wine in the Lounge. A stay in a luxurious Room. Daily breakfast buffet in Bluespoon Restaurant or via room service. Seasonal flowers as special welcome amenity in room. EUR 25 Food and Beverage credit for Bluespoon Restaurant. The Andaz inclusions; complimentary snacks and non-alcoholic drinks from the mini-bar, local phone calls, newspaper and Wi-Fi. Free admission to The Spa & Fitness. Offer valid from 1 June 2014 at Andaz Amsterdam, Prinsengracht. Reservations are subject to availability and must be made in advance. Package includes a stay in a luxurious Room, Daily breakfast buffet in Bluespoon Restaurant or via room service, Flowers and a bottle of Champagne as well as the Andaz inclusions; complimentary snacks and non-alcoholic drinks from the mini-bar, local phone calls, newspaper and Wi-Fi, Free admission to The Spa & Fitness. Rate shown is per room, per night, based on double occupancy; standard room accommodations. Room tax not included. Additional charges apply to room-type upgrades. Additional guests may be subject to additional hotel charges. Offer is not valid with groups/conventions and may not be combined with other promotional offers. Additional charges apply to room-type upgrades. Additional guests may be subject to additional hotel charges. Guest is responsible for all charges not included in package. No refunds for any unused portion of package. A portion of the rate for this offer may reflect taxes, service charges, gratuities, and third-party charges for certain included items, and those costs are not eligible for World of Hyatt® points. A limited number of rooms are allocated to this promotion. Promotional blackout periods may apply due to seasonal periods or special events, and normal arrival/departure restrictions apply. Hyatt reserves the right to alter or withdraw this program at any time without notice. Hyatt Hotels & Resorts® encompasses hotels managed, franchised or leased by subsidiaries and affiliates of Hyatt Hotels Corporation. The trademarks Hyatt®, Hyatt Hotels & Resorts®, Park Hyatt®, Andaz®, Grand Hyatt®, Hyatt Regency®, Hyatt Place®, HYATT house™, Hyatt Zilara™, Hyatt Ziva™, World of Hyatt®, and related marks are trademarks of Hyatt Corporation. © 2016 Hyatt Corporation. All rights reserved. Treat your family to an authentic, local experience that makes them feel inspired, encouraged, and connected. With 50% off on a second room for children 12 years and under there is plenty of room for everyone. On top, we will spoil the young guests with a special check-in, non-alcoholic mini bar and little gift. For the little ones under the age of three, enjoy the benefits of our "Very Important Baby" (V.I.B.) programme. We will make sure to welcome your baby with all necessities to make its stay comfortable, from a baby bath, baby crib and special baby care products to some fun toys and special cutlery. When reservations are made in advance, we also offer a babysitting service. Charges for this service can be obtained from guest services and vary according to the length of time a babysitter is required For reservations and further information, please call the Reservations Centre. 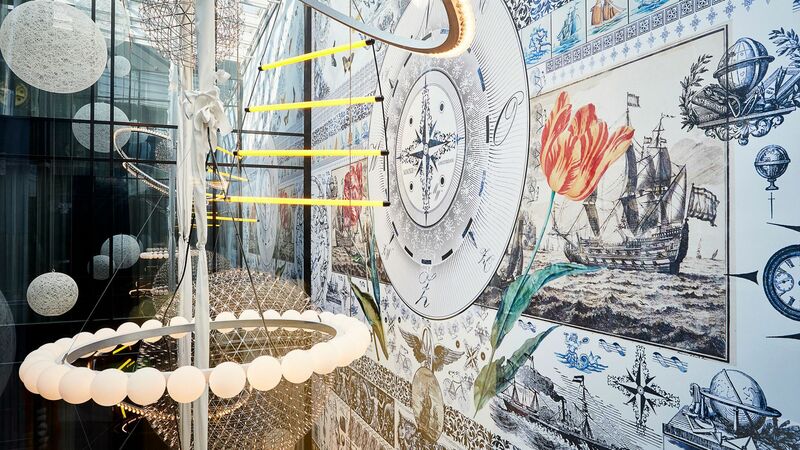 Family Fun is valid at Andaz Amsterdam, Prinsengracht as of 1 June 2014. All hotel reservations are subject to availability and must be made in advance by contacting the hotel or your nearest reservation centre and requesting offer code FAMPLN. Family Fun cannot be booked online. Book Family Fun and receive a second room at 50% off the prevailing rate. Family Fun is not valid with group/convention, wholesale, suites or Hyatt associate discounts. Both rooms must have the same duration of stay. Offer may not be combined with other promotional offers. Rate is per room, per night, excluding service charges, taxes and other incidental expenses. Rate is based on standard room accommodations. Additional guests may be subject to additional hotel charges. Family Fun package includes daily full breakfast for up to two adults and two children 12 years of age and under, and late check-out if Bed & Breakfast package is booked. Additional charges apply to room type upgrades.